The Australian Immigration Department's handling of a woman wrongfully deported to the Philippines was "catastrophic", according to a new report. The report, by a former police commissioner, found the mistake was due to systemic failings and a negative culture within the department. 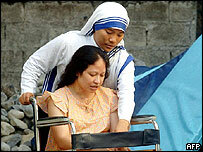 Vivian Alvarez, who has held Australian citizenship since 1986, was discovered in a Manila hospice in 2004. She had been unlawfully deported to the Philippines four years earlier. Australia's immigration department is already under fire for wrongfully detaining a mentally-ill Australian resident, Cornelia Rau, as an illegal immigrant. The "management of Vivian's case can only be described as catastrophic," former police commissioner Neil Comrie said in the report released on Thursday by Commonwealth Ombudsman John McMillan. "This report highlights some critical failures in public administration that had a dramatic adverse effect on an Australian citizen," Mr McMillan told local reporters. The report blamed a series of problems within the immigration department for Ms Alvarez's deportation. It also said that three senior officials, when they discovered their mistake, did nothing to rectify it. "Their failure to act is inexcusable - morally, professionally and legally," said Mr Comrie in the report. Immigration Minister Amanda Vanstone said two of the officials were being investigated for breaching their duties. A third has since resigned and faces no action, she said. Ms Vanstone also repeated the Australian Government's apology to Ms Alvarez and said she would try to arrange compensation and living arrangements for her "fairly and expeditiously". Ms Alvarez has refused to return to Australia until the government finalises compensation and proper medical care. Ms Vanstone also announced that the government would invest in improving the training of departmental officials, and increase health checks on detainees. Australia's tough immigration policies have long been criticised by human rights groups. Earlier this year, in the face of widespread pressure, the government ended its policy of detaining children, along with their families, on suspicion of being illegal immigrants.